Picture this: You open a business, you’re excited, it’s the only one of its kind in town — and then all of sudden the same type of operation opens right next door. You might think that would be bad for your business, right? In the craft-beer industry, at least in South Jersey, that’s not necessarily true, according to three craft beer-makers in Pitman. In fact, having “competing” breweries in proximity to one another may actually be beneficial — not only to the breweries but the municipalities in which they operate. But why? What distinguishes the brewery industry from other businesses that might prefer to hold sway over the market in which they serve? 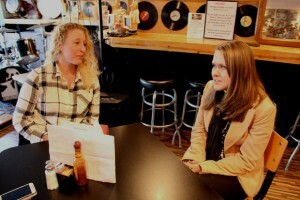 Recently, co-owners of the Human Village Brewing Co., 32-year-old Megan Myers, of Mantua Township, and 25-year-old Emily Barnes, of Harrison Township,announced they would be taking over the Bus Stop Music Cafe on South Broadway, to open up a brewery in the spring. The announcement came just about two months after craft-beer maker, 35-year-old Pitman native Justin Fleming, who is the co-owner of Kelly Green Brewing Co., already announced his plan to open his brewery just two doors down in the spring. The three brewers, who all recently got together at the Bus Stop Music Cafe with Bus Stop owner Vic Martinson, said that instead of seeing each other as competition, they see it as a positive for business — mainly because in the brewery industry having your operation located within a vibrant, flourishing destination area is paramount. Being near each other would only serve to create that vibrancy in Pitman’s downtown. “There’s no need to compete at a cutthroat level — It’s beer dude, it’s a relaxed atmosphere. We’re not Wendy’s, McDonalds, Burger King,” Fleming said. “Everyone has a stake in the community as a whole,” he added. 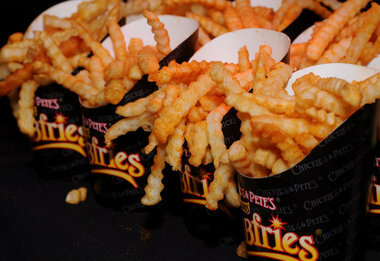 Chickie’s and Pete’s is joining forces with Herr’s to offer Crabfries-flavored potato chips. Myers said she saw Pitman as a place continuing to thrive — the reason she and Barnes wanted to locate in the downtown. The two breweries, according to John Fitzpatrick, president of the Pitman Chamber of Commerce, will serve as a mainstay to help drive the momentum the three business owners say is growing to make the downtown a thriving district. Myers also said New Jersey is very much an untapped market in the brewery industry, ranking 48th in the state for breweries per capita, and much less saturated than other states. She and Barnes said people are going to be willing to travel to a destination spot. They feel the two breweries located right off Route 322 will be a perfect spot to bring a lot of traffic.